Why Should You Get the Best Whole House Generator? What Do You Need To Know Before Buying a Whole House Generator? How Much Should You Spend on a Home Generator? 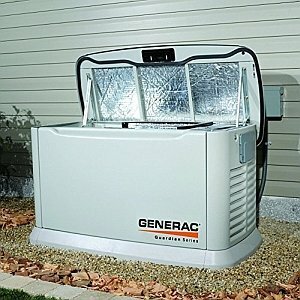 If you live in the area prone to the damage caused by hurricanes, you should invest in the best whole house generator to provide for a backup power supply. If you reside in a colder part of the US, getting a standby home generator can protect you from blackouts caused by winter storms. In any case – investing in one will certainly add a protective layer to your home and increase the value of your property. 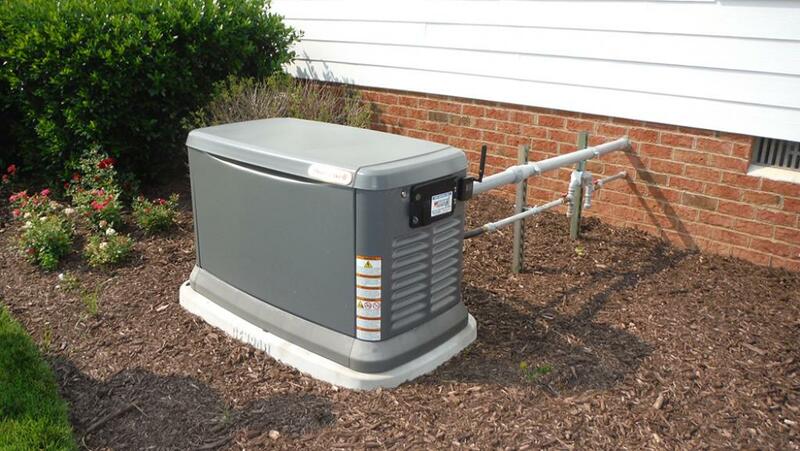 All standby generators presented in this guide can provide enough power to supply the entire household. In the event of a blackout, they can easily power all crucial devices in your home such as lights, refrigerators, heating, AC and – of course – the TV. The following guide lists the most recommended whole house generators currently on sale in the US. You will also find the brief reviews of these generators as well as the comprehensive buying guide containing everything you need to know before buying a standby generator. This 22 kW generator is the most heavily recommended choice for any household. It is one of the largest air-cooled home generators currently available on the market. With its 22000 watts, it is powerful enough to provide energy supply for the entire home including all major appliances requiring higher wattage such as air conditioning, heating, TVs etc. It comes with a whole house 200 Amp NEMA3 Transfer Switch suitable both for outdoor and indoor use. What I really like is the built-in wi-fi connection allowing you to control the generator with your computer or smartphone. You can also use the dedicated app to monitor the operation status and set up the maintenance schedule. For the generator of this size it is also pretty quiet. It can safely handle the sensitive electronics thanks to its True Power technology which guarantees less than 5% harmonic distortion. The 40346 is ideal for medium to large homes with 200 amp service and one or two central HVAC units. It comes with the powerful rugged 35HP engine which can be found eg. in tractors. It’s a reliable unit and the weekly diagnostic runs like clockwork. Some customers suggest in their reviews that the insulation could be a bit better at keeping this generator quieter. However, this can be easily remedied by setting up a DIY enclosure. Installation is not very complex. However, you’d better bring in an electrician for the final 240v hookup. A maintenance kit with handy oil and filters is also available as extras, as it is a heater kit which is actually recommended by those living in cold weather regions, as the light 5W30 oil can tend toward freezing. The ability to control the generator straight from your computer is also a major plus. This is a 16000 watt unit, suitable for most of the average size detached houses. It features a composite mounting pad which can potentially eliminate the need for a concrete base, depending on local ordinances. It also has a durable metal enclosure rated for 150mph winds – good news for those who live in the hurricane-prone area. 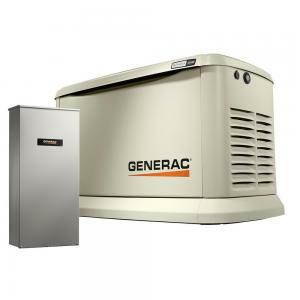 Generac 6462 runs on either propane or natural gas and is rated to operate with lower gas pressures. The runtime test is 12 minutes with options for scheduling weekly, bi-weekly, or monthly. Professional installation is relatively straightforward with this model, but even experienced DIY homeowners might want to pass this one up as some users suggested that the manual leaves a lot to be desired. Customer service has been reported a little lackluster at times, and you will have to rely on local dealers for service. Fortunately, there are few problems reported with the generator itself. For the most part, as long as it is properly installed and regularly maintained, it kicks in when needed in the events of long-lasting power outages. 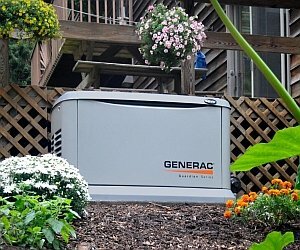 Just like other Generac standby generators this model can also be controlled via wi-fi connection with a smartphone or computer. Just don’t forget to keep the wi-fi mode turned on and you’ll be able to control the generator even from hundreds of miles away. This generator comes with a composite noise-dampening enclosure. It indeed runs more silently than some of its competitors. It can be set up for online monitoring and text alerts. It is a reliable, powerful and quiet generator that’s well worth the investment. In the event of a major power outage, it runs pretty smooth even on higher loads. Some minor adjustments may come along due to slight vibration and known engine throttle problems that can cause dirty power flow. The cause is often a bad carburetor gasket that’s relatively cheap to replace. Cold-weather users will want to pick up a carburetor heater. In addition to being very quiet for its size it also has very low levels of harmonic distortion, so you don’t have to worry about running your HD TV or laptops with this unit to rely on. While Kohler is a reputable and trusted manufacturer, several people reported less than ideal customer service as well as a few surprises regarding their warranty or service coverage in some areas. But if you read the fine print and follow Kohler’s instructions you wind up with an excellent generator that’s almost completely covered by a 5-year warranty. This 11,000 watt air-cooled, V-twin generator is relatively trouble free and runs strong even under the heavy load of a large house with things like pool filter and two-thirds of appliances going. A 250-gallon tank is recommended for liquid propane as it burns nearly 2 gallons of fuel per hour on a heavy load, though much less if you ease up on the power use. It is very easy to do the routine maintenance of changing plugs and oil, though the oil has to be pumped out. It is a little noisy under load but still quieter than a portable generator, and it does what it’s designed to do – power your whole house. One buyer reported it running perfectly for 7 days straight in the aftermath of a hurricane. 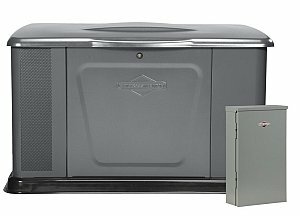 Other than that it has the exact same features as other Generac standby generators which happen to be the best on the market. For those who do not need as much as wattage as 16 or 20kW – this particular model is the optimal choice. If you absolutely can’t do without power to the entire house or don’t want to face the limitations of a small, gas-powered generator, purchasing a whole house generator is something that you should give serious thought. But a unit that really delivers comes with many advantages. You will never be without power. Unlike a quiet portable generator, a whole house unit is installed permanently on a concrete pad and connected directly to your home’s electric box to provide uninterrupted power that can kick in automatically. It is directly connected to a ready fuel source, such as gas, propane, or diesel, that can supply all of your electricity needs for days. A unit generating 20 kilowatts can easily power the average home, and you may not need to forego the microwave popcorn or even turn down the AC. It depends on the size of the home and power needs; a 5000 watt unit might be better for an RV or small cottage. Whole house generators allow even very large homes with high power use to keep things running smoothly no matter what happens to the public power grid. Most likely you’ll conserve power to conserve fuel, but if you’re one of those whose loved ones or livelihood depend on electricity being available, good quality whole house generator for your budget is vital. Boredom is also an issue. If you face the possibility of days without electricity, that means days without television, computers, electric lights, and all the other conveniences. More than boredom, it could mean misery. It means no AC or fans in the stifling heat of summer, and little warmth in the bone-chilling winter. No more home-cooked meals. Children and even adults will tend to go stir-crazy. Even if you have a camp stove or back yard grill for meals, no power means all that food in the freezer or refrigerator will go bad, and you’ll find yourself making daily trips for fresh supplies and bags of ice. Aside from comfort, there is also safety to worry about, without bright lights and backup power to security systems. If any of that sounds terrible, you should look into getting as much standby power as budget permits. The highest quality generators can be pricey. The more power you need, the more you’re going to pay up front. Then there are fuel costs. The more power you use, and the longer runtime the generator needs to provide it, the more fuel you need. The type of fuel a particular unit uses, and how expensive it is or difficult to get in your area, should be considered when shopping for a whole house unit. Fuel levels will have to be checked unless you want to be scrambling for fuel every time the weatherman predicts a storm. Some units might also require a certain amount of fuel pressure, so be sure your hardware or local utility can deliver. There’s also a noise factor. Even a portable generator can run at a constant 80 decibels – about the sound of a loud lawn mower, and running continuously. A whole house unit is generally more efficient and more insulated. But the noise level is something to consider, so be sure to take a look at the manufacturer ratings and consumer reviews for each prospective unit to give you some idea, balanced against any options for enclosures, insulation, or sound-proofing. Many models are given a rating of 62 decibels, but that is often the noise level measured at 25 feet away. The closer the generator is to your living area, the lower the level of noise you’ll be looking for. The only true noiseless sources of power are the solar systems but then – they are definitely not powerful enough to act as emergency whole house energy supplies. There may be more periodic costs. A licensed electrician will be needed to do the electrical work, and probably a plumber or local utility technician to hook the unit up to its fuel source. A contractor may have to come in to pour the concrete slab. Whole house generators tend to be bulky, so unloading, moving, and space requirements should be considered. Unless you or friends and relatives can handle all this safely and reliably, special labor costs should be factored in. 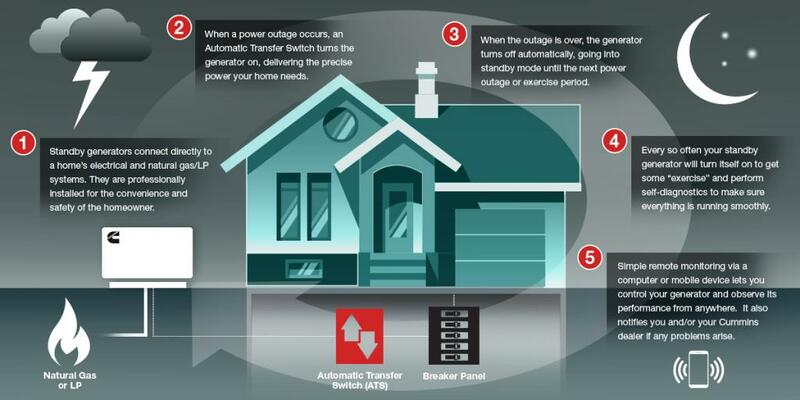 As a home generator is a permanent addition to your home, and will generally contribute to its value, you may also run into red tapes such as building permits and property tax. There are also safety inspections and code requirements. Sometimes the retailer or installer will handle these things, but it pays to be sure up front, so you don’t get slapped with a fine or citation for non-permitted improvements. Odds are you won’t need the unit to run at full blast 24/7, but noise levels and fuel consumption can also be dependent on run time. Before purchasing, make sure a trained technician visits your home to assess your power needs, living area cubic footage, home electrical system, appliances, and possible installation issues. Find out the minimum level of wattage you need, and go from there. There’s also quality and durability. Whole house generators work hard and will need maintenance if they’re going to be ready to power your home in an emergency. The best whole house generators can be set up with periodic self-tests to ensure they’ll be up and running when needed. Standby generators require a short run-time periodically, known as exercise, to test and ensure the system is functioning properly and ready for an emergency. Be aware that the energy produced by generators is not the same as grid-supplied electricity. Generators produce harmonic distortion, which can affect or even damage sensitive devices like televisions and computers. To get your own rough estimate of what kind of power you’ll need, you’ll have to add up the relative requirements of the appliances in your home. You can find a guide online on sites like consumerreports.org. Adding up all these numbers will give you an idea of the maximum wattage you might be consuming. though you should refer to an expert technician for actual needs, at least this will give you a rough idea of what kind of wattage you’re going to need. A permanent generator that provides 10-15 Kilowatts will typically cost between $3,000 – $10,000, and an added $400 – $1,000 for installation fees. A larger generator that can provide 20 – 40 Kilowatts will usually cost between $5,000 and $20,000. These generators will operate even if you’re away, saving you the headache of returning home to a refrigerator full of spoiled food. In terms of relative costs, it’s often wiser to spend that extra $500 or so on higher wattage for your family needs. To determine the best whole house generator for your needs, make a list of items you would want to be powered during a blackout. Each device should have a watt rating. If there is only an amps rating, multiply that number by 120 to find the wattage. If an appliance uses a motor, you’ll have to find the startup wattage and use that instead. Add up the total wattage of the items, and then add an additional 10 or 15 percent to be safe. This is the amount of power your choice of the best whole house generator must provide in order to meet your needs. 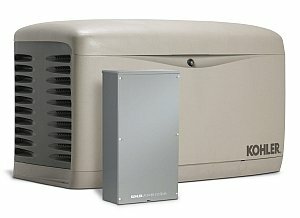 Even the best whole house generators involve extra costs such as fuel tank installation and set up fees, consider that generators are generally a little larger than comparable AC units, and regulations usually require that they be located x amount of feet from property lines or dwellings, and concealed by fences or shrubbery, all of which can add up. Some local regulations may also include periodic inspections. On the plus side, a smart choice in the form of the best whole house generator will more than likely raise your home’s value and lower home insurance rates.